Election authorities proclaimed Hugo Chavez’s handpicked successor Venezuela’s president-elect last Monday, despite his challenger’s demand for a recount. “It was a result that was truly fair, constitutional and popular,” Nicolas Maduro Moros said, criticizing his opponent’s refusal to concede. Maduro Moros secured 50.8% of votes in Sunday’s election, while opposition candidate Henrique Capriles Radonski won 49.0%, Venezuela’s National Electoral Council said Monday. The South American country’s top election official certified the results at a ceremony in Caracas, saying Venezuela’s voting system had worked perfectly. The representation of numbers, as physically measured on the surface of the graphic itself, should be directly proportional to the quantities represented. We will discuss more about Mr. Tufte’s work in future blogs. The chart above is a good example of the Lie Factor. The election has a paper-thin margin of victory. Supporters of Radonski, as well as the World political community, are asking for a recount and an audit. However, if you were to look at the two vertical cylinders in the chart above, it would appear visually that the election was not even close. But something happened that made me remember that most Bad Charts are created to purposely mislead the public: 7 people were killed in the protests following the election. As a person who can read a chart (or numbers), you can tell that the results of Venezuelan elections were a really close call. So close, that the opposition candidate, Henrique Capriles Radonski, demanded a vote by vote recount, a position backed by the Organization of American States and the United States. People have gone to the streets to show support for their candidates, which is what lead to 7 people being killed on Tuesday, plus dozens injured, hundreds arrested, and property damage, including several universities. 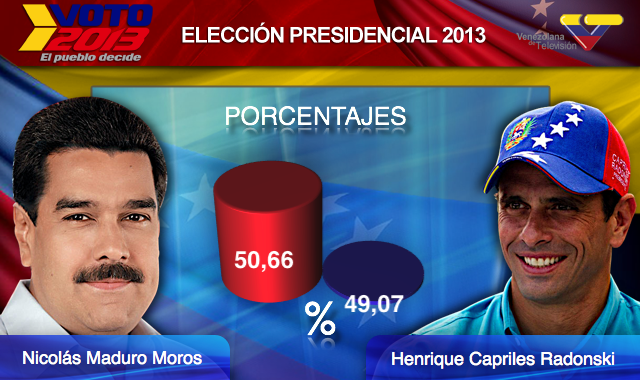 Capriles had to call off the rally planned for yesterday to demand a recount in fear of further violence. Instead he asked his supporters to go out to the streets every night at 8pm and bang pots and pans to show defiance. In response, Maduro asked his supporters to throw fireworks at the same time. Excellent way of describing, and nice article to get data about my presentation subject matter, which i am going to present in university.